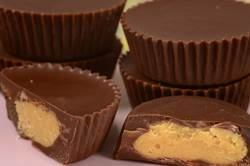 Peanut Butter Cups were introduced in the 1920s and have been popular ever since. Did you know that you can make them at home? They really are quite easy to make and I think every bit as good. All that is required is to melt some chocolate, place a little in a candy cup, top with a little peanut butter mixture, and then drop a little more chocolate on top. What you end up with is a shell of chocolate with a smooth and creamy peanut butter filling inside. So delicious that you may want to make a double batch. Now homemade Peanut Butter Cups do not taste exactly like the commercial ones. And that is what I really like about making them. You can chose the type of chocolate based on your own personal preferences. So while commercial peanut butter cups are made with milk chocolate, you could do that or you could make them with a combination of both milk and semi-sweet chocolates (my personal preference). As you know every brand of chocolate has its own unique flavor so this is where you get to chose how your peanut butter cups will taste. You can even change the ratios of milk to semi sweet chocolate if you like. But keep in mind that we are not tempering the chocolate, so you will need to store the peanut butter cups in the refrigerator so the chocolate remains shiny with a nice snap. Otherwise, if you stored them at room temperature, the chocolate will become a little soft and develop a white coating (called bloom) after a day or two. To make the peanut butter filling all you do is combine peanut butter with a little butter and confectioners sugar. This makes the filling sweet and creamy with a nice peanut flavor. Peanut butter is a smooth paste made from roasted peanuts. The peanuts are ground, and then salt, a sweetener, and sometimes a stabilizer (to keep the oil from separating) are added. Peanut butter that is labeled "Old-Fashioned" or "Natural" does not contain a stabilizer. I find that peanut butter that contains a stabilizer works best in this recipe. Place the peanut butter, butter, and salt in a microwaveable bowl. Heat in the microwave until quite soft (for about 30-60 seconds, but check and stir every 20 seconds). Stir in the confectioners sugar. Melt the chocolates and shortening in a heatproof bowl, placed over a saucepan of simmering water. Spoon, or pipe, about one teaspoon of the melted chocolate into each of the paper cups. Tap the pan gently on the counter to smooth out the chocolate. Spoon (or pipe) a scant teaspoon of the peanut butter mixture on top of the chocolate. Then top with another teaspoon of melted chocolate. Tap the pan gently on the counter to smooth out the peanut butter cups. If necessary, add a little more chocolate to get a smooth top. Refrigerate about 20 minutes or until set. Store in an airtight container in the refrigerator or they can be frozen. Makes about 36 peanut butter cups. Preparation time 30 minutes.